So here we are 3.5 years later. With record affordability. And close to record mortgage rates. 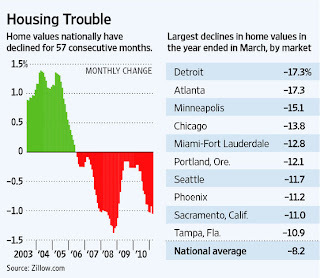 And still housing prices are dropping. I won't go into the litany of reasons that we discussed ad nauseam in 2008-2009 on why this would be the type of housing downturn the likes we've never seen before. But let's be clear, despite the protestations of most on financial infotaintment TeeVee we have years more to go before prices clear. * And of course, this May, June, July we will see an uptick in housing activity - as we DO every spring/early summer - and the Kool Aid drinkers will be making their bottom call yet again. (3rd year running) One day these broken clocks will be correct. *As always I am excluding places with bubble economics like Washington D.C. [Mar 11, 2010: [Video] America's 3 Wealthiest Counties Now Ring Washington D.C.], areas where Federal Reserve handouts galore continue to the financial community like Manhattan, or "America's Australia" aka the northern plains states. This morning's Wall Street Journal cover piece is about the "shocking" downturn in the housing market, without the government paying people to buy homes as we did 12-24 months ago. Home values posted the largest decline in the first quarter since late 2008, prompting many economists to push back their estimates of when the housing market will hit a bottom. Home values fell 3% in the first quarter from the previous quarter and 1.1% in March from the previous month, pushed down by an abundance of foreclosed homes on the market, according to data to be released Monday by real-estate website Zillow.com. Prices have now fallen for 57 consecutive months, according to Zillow. Last year, the housing market showed signs of improving as price depreciation slowed in some markets and stabilized in others. In response, a number of economists began forecasting that housing would hit a bottom in late 2011, then begin to recover. But the improvements, spurred by federal programs that gave buyers up to $8,000 in tax credits, proved fleeting. (uhh, I believe the current parlance is "proved transitory") Sales collapsed when the credits expired last summer, and prices in many markets have been falling ever since. While most economists expected sales to decline after tax credits expired, the drag on the market has been greater than many anticipated. "We expected December and January to be bad" as the market reeled from the after-effects of the tax credit, said Stan Humphries, Zillow's chief economist. But monthly declines for February and March were "really staggering," he said. They indicate "a reflection of the true underlying demand, which is now apparent because most of the tax credit is out of the system, and it's being completely overwhelmed by supply." Prices are decelerating in large part because the many foreclosed properties that often sell at a discount force other sellers to lower their prices. Mortgage companies Fannie Mae and Freddie Mac have sold more than 94,000 foreclosed homes during the first quarter, a new high that represented a 23% increase from the previous quarter. More could be on the way: They held another 218,000 properties at the end of March, a 33% increase from a year ago. Paul Dales, a senior U.S. economist with Capital Economics, says prices could fall by as much as 10%, down from his previous forecasts of around 5%. A March survey of more than 100 economists by MacroMarkets LLC forecasts a 1.4% drop in prices this year, down from the December estimate of a 0.2% decline. 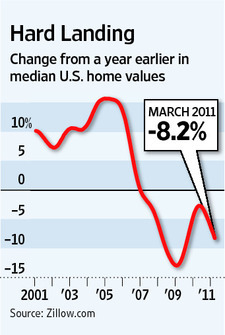 Other home-price indexes also show weakness. The widely followed Case-Shiller index published by Standard &amp; Poor's showed that prices climbed from April 2009 until last summer, when they started declining as tax credits expired. Today, prices are on the verge of reaching new lows, the index shows. The Case-Shiller index tracks repeat sales of previously owned homes using a three-month moving average. According to the Zillow index, a handful of California markets and Washington, D.C., saw price appreciation last year, but that has since reversed. Mr. Humphries attributes the "double dip" in those markets, which include Los Angeles, San Francisco and San Diego, to the way in which the tax credit stimulated demand from buyers. When the tax credit went away, markets were left with rising supply from foreclosures but with less demand from buyers. To be sure, steep declines in home prices along with mortgage rates near their lowest levels in decades have helped make housing more affordable than at any time in the past 30 years, according to Zillow. Markets that have lower levels of foreclosures, such as Dallas, and those with better job-growth prospects, such as Washington, are faring better. Buyers who qualify for mortgages are demanding bigger discounts as added insurance against further declines in values. Sellers, meanwhile, are balking. "More often, they don't want to take the first offer," says Jeffrey Otteau, president of Otteau Valuation Group, an East Brunswick, N.J., appraisal firm. "What they don't realize is, in an oversupplied market, the next offer is for less." While some analysts have argued that home prices need to fall to "clearing prices" that will attract more buyers, price declines could also complicate any recovery by pushing more borrowers under water. Zillow estimates that more than 28% of borrowers owe more than their homes are worth nationally. Those numbers are much higher in hard-hit markets such as Phoenix, where more than two-thirds of borrowers owe more than their homes are worth. Average home prices are down 8% from a year ago, 3% over the quarter, and are falling at about 1% every month, according to Zillow.